The Center for Sharing Public Health Services is a national initiative managed by the Kansas Health Institute with support from the Robert Wood Johnson Foundation. For more information about the Center, download our brochure. Cross-jurisdictional sharing is the deliberate exercise of public authority to enable collaboration across jurisdictional boundaries to deliver essential public health services and solve problems that cannot be easily solved by single organizations or jurisdictions. 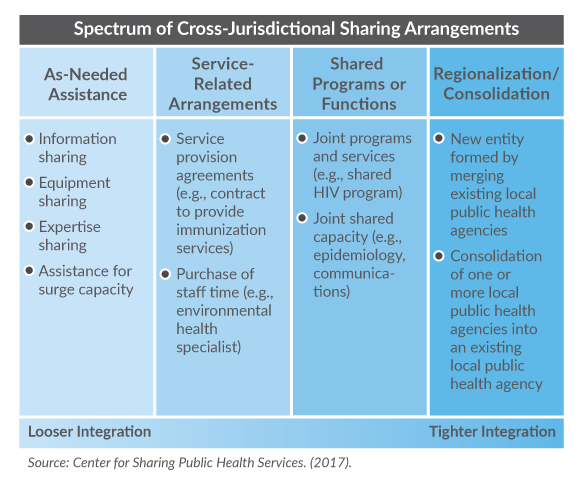 The Center for Sharing Public Health Services has identified four main types of CJS arrangements, as depicted on the Spectrum of Cross-Jurisdictional Sharing Arrangements. The governance model, financial structure and decision-making process can be different for each type of arrangement on the Spectrum. Generally, moving from left to right along the Spectrum, the level of service integration increases, the level of jurisdictional autonomy decreases, and implementation becomes more complex, as can governance. The Spectrum was updated by the Center in 2017.